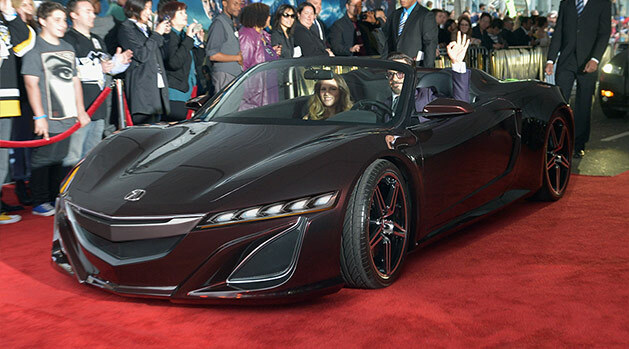 I remember when the mysterious Acura Roadster was first spied on set last year during the filming of The Avengers, everyone asked, “Where the heck are the headlights?”. That silver strip that ran across the entire front actually looked pretty cool, but it still had me wondering, what would it look like with actual headlights in place? With some quick photoshop I gave the Avengers Roadster the headlights found on the NSX Concept and also a slightly darker, more metallic looking grille. It’s not my best work, but it’s nice to finally visualize that idea I had in my head. Click the thumb below for a high resolution image. I can’t decide if I like the front colour matched like that or black like on the concept. Either way I can’t wait to see this car on the road!